It doesn't take much examining to think the Staad is a stud amongst gear bags. Its unique yet vintage-like suave design means that it'll look like it belongs with a suit and tie. The Staad is not going to please everyone's taste in gear bags, nor will it look as good as it does being worn over a plain t-shirt. Unlike the more ordinary urban and mainstream backpacks and bags we have reviewed, WaterField's Staad takes a special kind of person to rightfully rock it right. Because otherwise, you may end up looking out of place. Like all of WaterField's offerings, the Staad is handcrafted in San Francisco using quality materials. In this case, the Staad is made using a beautiful, genuine distressed leather as the main compartment flap as well as the leather accented trim running down the middle. The quality of the leather used to make the Staad is once again very impressive; and beautiful in its wearing characteristics. It has an ample thickness to it which gives the flap a sturdy, weighty quality. WaterField's leather is one of the nicest, thick-chosen western-like cowhides we have seen being used in gear bags. You can definitely notice the difference in quality which sets the Staad's leather apart from mass produced branded leather bags. And for that you're going to pay a hefty sum. The Staad in a stout configuration as you see it here will set you back $329, or $319 for a faintly slimmer variant. While the flap and other small trim parts are made out of leather - the rest of the Staad's body is either available in WaterField's iconic durable black-colored ballistic nylon fabric material or in a tanned waxed canvas material which like the leather, will also wear in a unique manner from general use and contact. Just to be clear, both materials are water-resistant. And although I think the waxed canvas is amazing in its own right, I opted for the black ballistic nylon out of the simple cleanliness that it offers. It also looks incredible with the distressed leather contrasting the otherwise synthetic material. In addition to the "grizzly" leather flap color you see here, the Staad can be built using black or chocolate leather with you choice of black ballistic nylon or waxed canvas. So you can create a very stealthy backpack or one that stands out. Looking at the Staad's exterior we see a very svelte, clean facade with two flanking side pockets hidden away from plain view. The YKK zippered pockets blend into the Staad's black nylon material thanks to their flat, splash-proof zipper teeth covering. These zippers remain black even when picking the tan waxed-canvas material which obviously creates a different look due to the color contrast. Having these two side zippered pockets is great for stashing those small, quick-grab essential items like your keys and sunglasses. 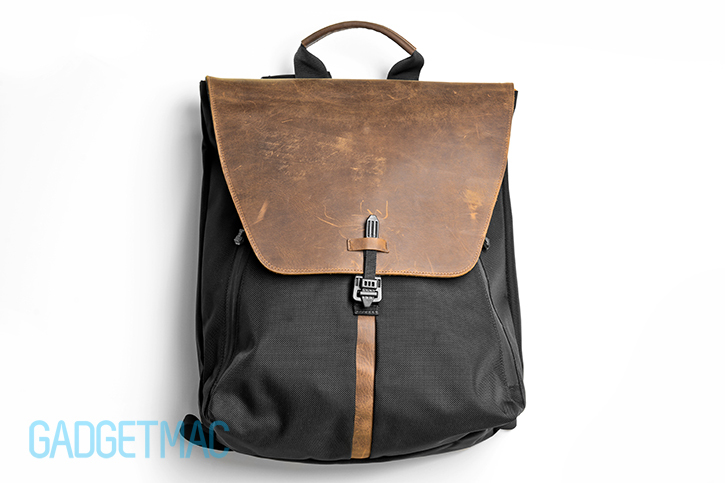 The Staad backpack is available in two sizes: slim and stout. With the stout already being somewhat on the more compact-ish size, I strongly advise that you should avoid the smaller slim sized Staad. If only because the stout-sized Staad isn't a bulky backpack whatsoever and the price difference between the two models is insignificant as it is. 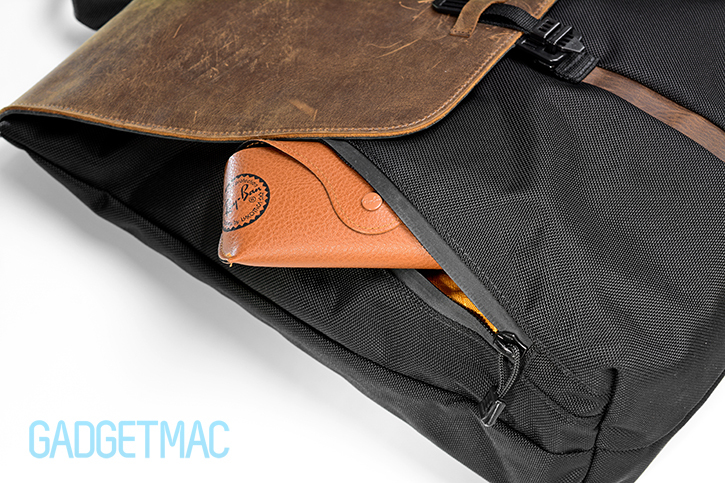 The stout can carry a MacBook Pro up to 15-inches in addition to an iPad Air, or an equivalent tablet. The slim on the other hand can only carry a 13-inch MacBook Pro or MacBook Air as well as a full-sized iPad or equivalent tablet. You can also see that the Staad has very slim and tapered profile that gradually widens towards the bottom. Owning a really good looking and unique backpack is superb, but none of that really matters when you've got a backpack that doesn't seem like it can carry your load while being comfortable to wear. Fortunately, the Staad has been quite comfortable to wear for long periods of time even when loaded to its fullest capacity. That being said however, I feel like it could have used a little more padding. While I can't say anything bad about the Staad's rear back-support padding, I wasn't that impressed by the Staad's shoulder straps. I'm used to using backpacks with ergonomically designed and heavily padded strap systems along with metal hardware and plenty of adjustable strap length. None of which is present on the Staad. If we were to compare the Staad up against equally priced offerings, there's no question it would fall short based on ergonomic strap and hardware system. Then again, the Staad was designed to have a narrow, elegant profile. 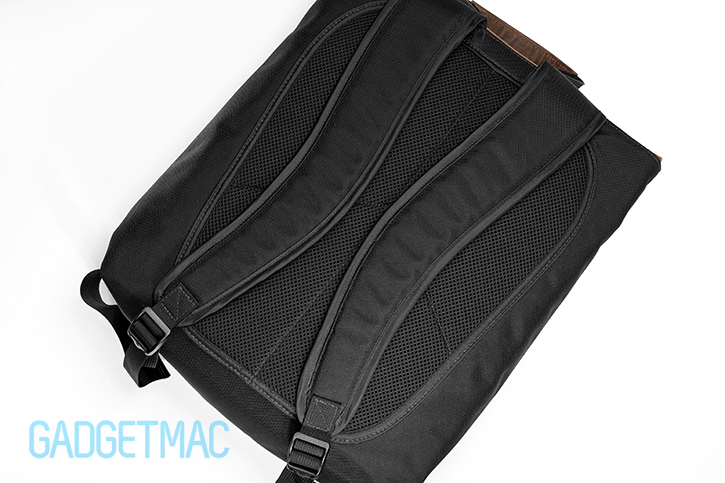 And suffice it to say you'll be hard pressed to find a similar backpack to the Staad with superior support. Considering the Staad is geared towards urban commuter use and not a traveler's carrier, the Staad's basic shoulder strap implementation will suffice - albeit still seems underwhelming considering the price you're paying. I like the fact that WaterFeid keeps finding ways to up the ante with the most smallest details like using these unique ways of offering a flap closure mechanism. From the ultra-robust, metal Cobra quick-release buckle made popular by the Cargo bag and the HardCase – comes this entirely different yet equally awesome quick-release closure mechanism inspired by a WWII-era ammunition clip closure. Despite having a military influence, the Staad's closure buckle is anything but crude. It's incredibly simple in its design yet with a modern improvement, very elegant and best of all, it compliments the Staad's vintage styling better than anything I've seen yet. Although it is made out of nylon plastic, it does seem to be durable enough to do its intended job. And so far it hasn't let me down. It may look benign, but it's unbelievably strong in securing the flap in its place even when tugging and pulling the flap by the Staad's own heavy weight when loaded up with gear. The way that this ammunition clip-style closure clasp functions is in two steps. But the good news is that when you come to open the flap, there's just one step that stands in your way between accessing the Staad's interior compartment. Pull on the tab and the buckle closure will unlock as the flap pulls away to make accessing the interior quick, effortless and surprisingly fun. Because the clip has two parts that are attached to the front flap, the first is a buckle which is designed to sit around a D-ring mounted to the body of the backpack, while a nylon fabric tab strap with a plastic flat spear-like pin at the end of it pierces through the buckle where it ultimately holds everything together like a finger plugging a tiny hole in a dam. Only an intentional pull on the strap from the top will release the buckle closure, nothing else. Once the flap is opened, the interior compartment is revealed. You'll notice that it features the same splash-resistant coated zipper for the purpose of making it easier for you to reach down the bottom of the Staad for things other than pulling your laptop or tablet from their respective compartments. And speaking of compartments, the Staad's interior isn't the roomiest backpack interiors we've seen, but for a backpack that puts a stylish slim form factor in front of it, I think there's just enough room for most individuals who would like to carry with them their laptop and other small essentials like a portable wireless speaker and a pair of noise-canceling headphones. The interior features two separate, lightly padded compartments for a laptop and a tablet, while a large single compartment is suitable for everything else. WaterField has done a terrific job with these dual tablet and laptop sleeve compartments I should say. They've each got a black microfiber lining on one side, and a golden nylon fabric on the other just to ensure that you'll be able to easily slide and pull your devices without too much friction. To give you an idea of what I was actually able to comfortably carry around: a 13-inch Retina MacBook Pro along with its power adapter, Retina iPad mini and a USB charger, UE Boom Bluetooth speaker (two if I needed), UE 6000 over-ear noise-canceling headphones, a small non-DSLR camera like the Sony RX100 2 (or an equivalent), and a few other small bits and pieces without overstuffing or altering the Staad's native tapered form factor. I should also note that the Staad's interior compartments and pockets are all fully lined with WaterField's staple bright golden lining for extra visibility. Last but not least, you'll find two small interior pockets secured with Velcro tabs adjacent to the laptop and tablet sleeved compartments where you can store small accessories like a cleaning cloth, backup battery charger and your phone - at an easy reach. And if you must carry your passport or tickets with you, keeping them inside this interior compartment will also be a safer choice. Having now used both versions of the Muzetto leather and waxed canvas shoulder bags, I honestly don’t see any reason why the Staad should be this expensive considering it is more costly than any one of WaterField’s leather shoulder bag offerings. 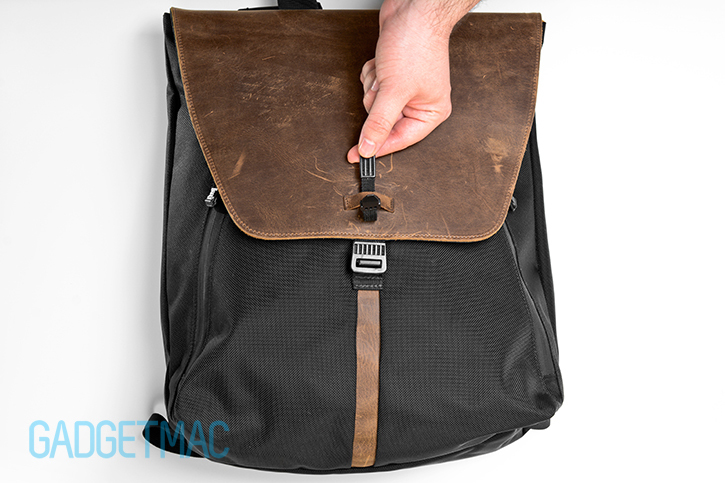 That said, the Staad is indeed a one-of-a-kind handcrafted laptop plus tablet backpack with ample carry capacity, built with excellent materials, features a striking quick-release flap fastener and is all in all a pleasure to use. Therefore we only think it would be fitting to give the Staad our general recommendation. If you’re looking for a really nice classy backpack to carry your tech gear on a city commute and straight into an office meeting without looking gaudy, should you choose, we think WaterField’s Staad is a handsome option you'll be happy with. At $329, we see the Staad as being one-off laptop backpack that will satisfy a niche group of people considering its price and vintage appeal. It is helplessly beautiful. Alas, not the type of gear bag that I'd personally consider using with all due respect.